Holiday village dedicated to fishing overlooking a lake of 7ha! Consists of 12 wooden cottages with 6 "feet in the water." 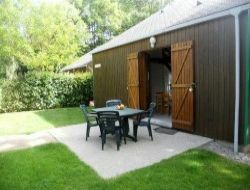 The cottages and camping *** offers comfort and equipment specific to fishing. Camping with toilets and a kitchenette individual. In the countryside in an old farmhouse, our cottage can accommodate up to 9 people in a space of 125m ² with garden, including 5 bedrooms, quiet assured with superb terrace facing south. 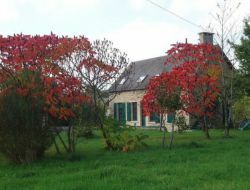 Gîte near the famous paintings of Mayenne, 1h30 from Mont St Michel and 1h40 from St Malo. You dreamed of the countryside ? Then look no further! At the foot of the small flowered village of St Denis du Maine in Mayenne, a village of 8 deposits 4 to 6 people. The leisure base of Chesnaie with its large green areas and its lake of 11 hectares, will overwhelm you. 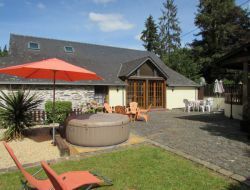 La Petite Coquais is a superb, spacious barn conversion in the heart of the Pays de la Loire region with 3 en-suite bedrooms which sleeps up to 6 people with a secluded ,south facing, private garden with hot tub. 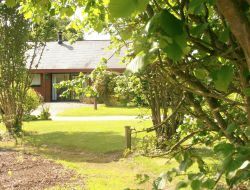 Set in a small hamlet amidst our own 16 acres of private fields and woodlands we can offer our guests exclusive on site fishing on our 3 very different fishing lakes containing Carp, Catfish and Sturgeon. 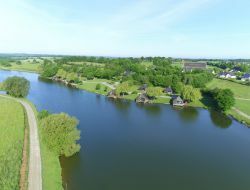 Village of 11 cottages with all comfort for 5 / 7 seats (lounge with fireplace) for a nature holidays in Mayenne (Loire Area) with an animation program around the environment and nature, for adults and childs! Unusual accommodations on the road of the Brittany and near Normandy, 4 huts perched in trees wait for you on this magnificent cradle of greenery to make you live unusual night under the starry sky. 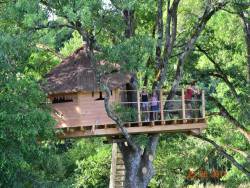 What of better than to spend an unusual stay in trees in family or with the beloved one to live moments of complicity!